It's been nearly 2 years since Children of the Corn: Runaway was announced and now we finally have a release date and a trailer. The movie was reportedly worked on in secret, filming in Oklahoma City under the direction of Feast director John Gulager in effort for Dimension to rush the movie out in order to keep the rights to the franchise. It was also learned that production ended on April 2nd of 2016, but it's been pretty much silent ever since then, until now. Bloody Disgusting reports that Children of the Corn: Runaway will officially be released to Blu-ray and DVD as well as VOD on March 13th, which is awesome news. Bloody Disgusting reported back in November that the movie was either going to be released in February or March by star Marci Miller. At the time, that was the most news that had been heard about the tenth installment in the Children of the Corn franchise and the first since 2011's Children of the Corn: Genesis. In addition to the release date announcement, there's also an intense trailer for Children of the Corn: Runaway that looks very promising. It has all of what you would expect in a trailer promoting something that was based off of a Stephen King story, with plenty of suspense surrounding children. The official synopsis for the movie reads. "Children of the Corn: Runaway tells the story of young, pregnant Ruth, who escapes a murderous child cult in a small Midwestern town. She spends the next decade living anonymously in an attempt to spare her son the horrors that she experienced as a child. Ruth and her son end up in a small Oklahoma town, but something is following her. Now, she must confront this evil or lose her child." The minute-long clip goes a long way in hyping up the release of the movie, which is good because we only have to wait about a month and half for it to come out. 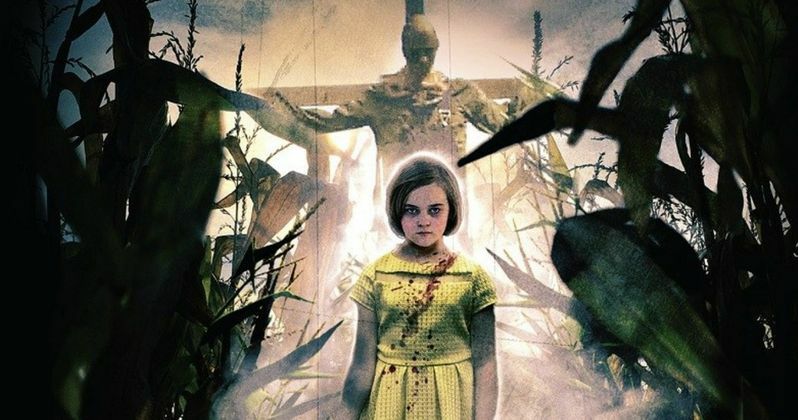 Children of the Corn: Runaway joins the long list of direct to video releases of the franchise and looks to be one of the more intense installments released to date. Dimension and the Weinstein Company's latest controversy is rumored to be one of the reasons that the movie was delayed. However, Harvey Weinstein's troubles didn't fully come to light until the very beginning of October of last year, so it's not entirely clear what the reasoning behind the holdup was. Hellraiser: Judgement was also announced around the same time as Children of the Corn: Runaway, and news has also been scarce about that project as well. Children of the Corn: Runaway is all set for release on March 13th after nearly 2 years of radio silence. The lack of information and mystery surrounding the project certainly add to the allure and the trailer seems to be an indicator of good things coming to those who wait. You can check out the trailer for Children of the Corn: Runaway below, courtesy of the LionsGate YouTube channel.